An excellent choice for those who already have quality omega 6 sources in their diet or those wanting to build their omega 3 levels. A delightful nutty taste makes it easy to mix into foods and smoothies. Certified Organic - the oil is pressed from certified organic seeds, carefully selected for flavour and maturity. Fresh, highly nutritious and rich in Omega 3 as opposed to most supermarket oils whose vital nutrients are destroyed during processing. Suggested use: pour around 3-4 dessert spoons on your food. Once opened, best to consume within 8 weeks. 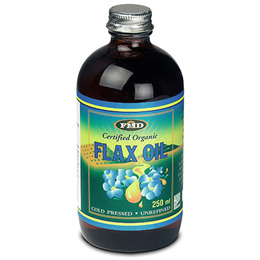 Do not cook with Flax Oil. Below are reviews of FMD Organic Flax Seed Oil - 250ml by bodykind customers. If you have tried this product we'd love to hear what you think so please leave a review. Lovely flax oil! I put a dessert spoonful into a smoothie every day, and it's really nice! thanks bodykind for stocking it!!!!!!!!!! !